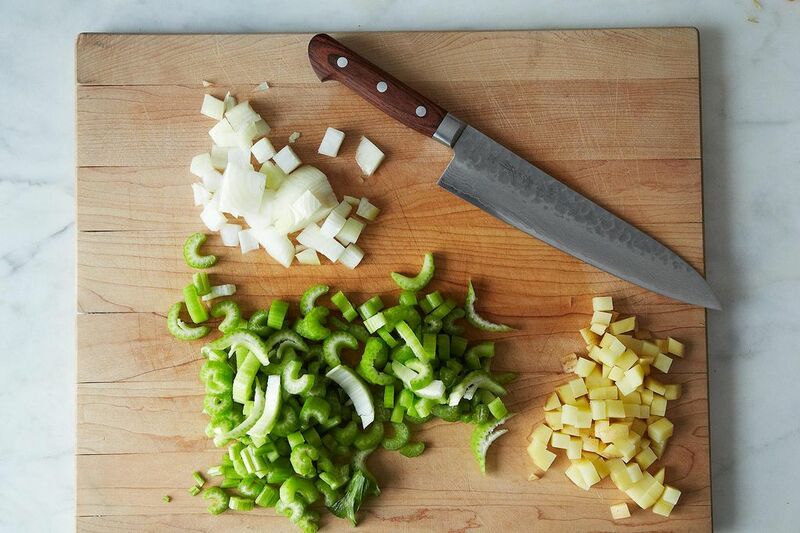 Today: Treat your knives well, and they'll love you back. Here's how to sharpen your most essential tool, any which way. The world’s sharpest knives belong to newlyweds. It’s all downhill from there -- the more you cook, the duller your most important tool becomes. It's only through regular maintenance that cooks keep their blades sharp. Knife sharpening, like shoe shines and TV repair, is something of a casualty in our throw-away culture, but learning to care for your tools is more than just prudent; sometimes, the methodical, rhythmic ring of steel on stone is therapeutic after a frazzled day at the office. It’s a good habit to use a sharpening steel every time you take out your knife. A steel is the fat round thing in your knife block that looks like a metal lightsaber. This method is like 2 minutes of cardio for your blade; it quickly aligns all of the metallic ions in the knife's edge so that you can part your proteins with ease and precision. Simply hold the knife in your dominant hand, lay it nearly flat against the steel at about 22 degrees (think about it as half of 45 degrees), then draw it across the steel 10 times on each side. The steel won’t restore an edge to a dull knife, but it will help you keep an edge longer on a well-maintained knife. 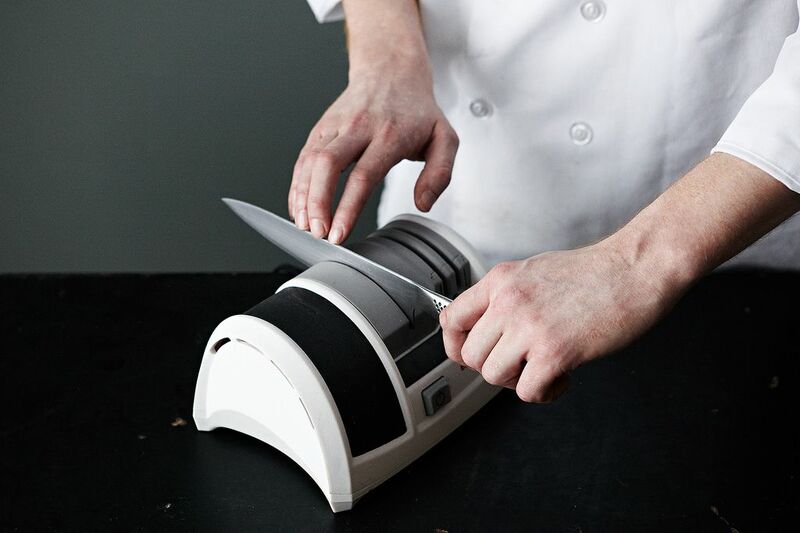 The electric knife sharpener is the fastest way to restore your blade to health., but it’s also the most brutal. The edge of a knife is a carefully tapered compression of metal layers, and everyday thwacking sends the atomically aligned edge into disarray, or worse -- it can chip tiny divots into the metal. An electric sharpener simply obliterates the old edge and tapers a new one. For the average knife, there are worse fates. But, if you happen to own a Japanese cold-forged sabatier made from Valyrian steel, this is a sad, sad day indeed. More: Our philosophy? The prettier the knives, the more likely you are to take care of them. 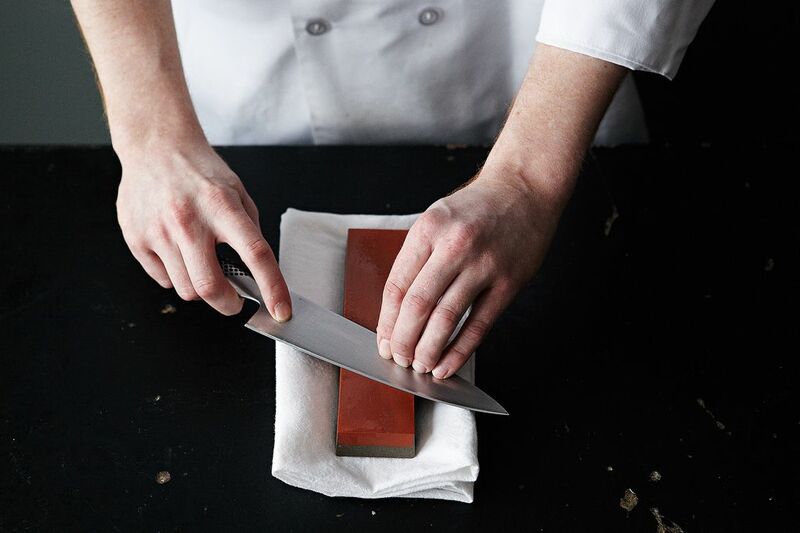 If you have a very nice knife, sharpen it with a whetstone. A stone will set you back $10 at the hardware store (although you can spend more on ceramic and glass models). Moreover, it’s a great meditative practice, like zen archery -- except that you can do it in the confines of your own apartment. Sharpening stones come in different sizes and grits (the stone's level of coarseness), which are often indicated by color, depending on the brand. Some stones have two sides: a coarser side for removing dents and sharpening very dull blades, and a more refined side used for polishing and edge refinement. 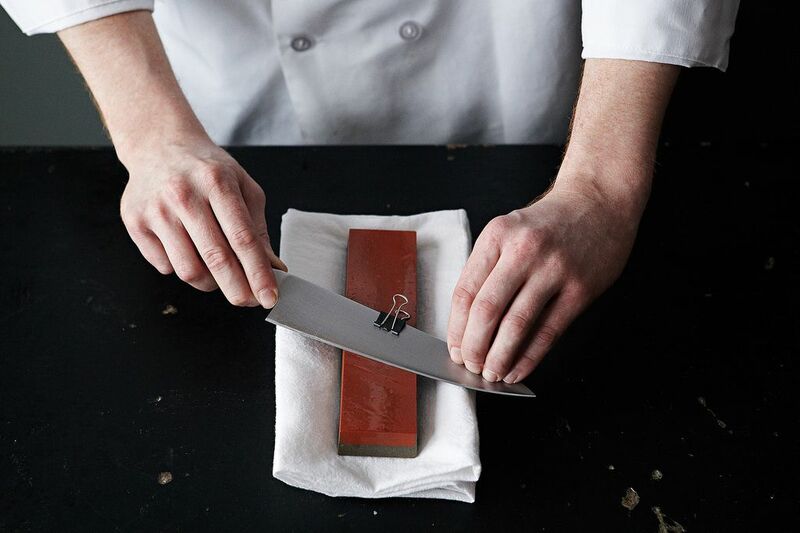 The rule of thumb is to always start sharpening your knife on the coarse side, moving to the refined side to finish. If your countertop is slippery, place a rubber mat or towel underneath the stone. Some stones should be used with either mineral oil or water, but not all stones require a lubricant. Read the instruction manual that comes with your stone in order to avoid damaging your knife. The key to sharpening your knife with a stone is to keep your blade at the proper angle, about 22 degrees. To eyeball it, it’s helpful to think of it as half of a 45-degree angle. Another helpful way to maintain the proper angle is to attach a 1/4 inch binder clip to the spine of your knife. This will keep the blade consistently at a 22-degree angle as you draw it against the stone. Lay the blade against the stone, with the tip pointing at 11 o’clock and the sharp edge pointing away from you. With one hand on the hilt, and the other guiding the tip and maintaining the angle, draw it up the stone slowly, from left to right, with minimal pressure. You can repeat this movement a dozen times or more. Then, turn the knife over, and with the tip at 2 o’clock, repeat the same movement from right to left. This may feel a bit more awkward -- just listen to your inner Mr. Miyagi coaching you: Slowly! Gently! Turn the stone over to the side with the finer grit. Perform the same sharpening actions on both sides once again, further tapering that edge. When you’re done, break out that sharpening steel and draw the blade against it a few times. Then, be sure to clean the knife with a damp towel to remove any excess metal or grit. Razor-sharp knives may sound scary, but they’re actually much safer than forcing semi-dull tools through stubborn tomatoes. You might even find they make your cooking taste better, too. Note: None of these techniques will work on a serrated knife. So skip that one. Dad at home, and in the kitchen. I cut meat for 35 years and still use the whet stone and steel at home on all my knives. I still use my old Meat Cutter knives. I pull the sharp edge of the knife facing in the pull direction on the whet stone. Reversing direction every 3 to 4 times. To get the right angle follow the manufactures angle. My knives are always razor sharp. Pull the blades on the steel a few times on each side after stoning them. I love the binder clip hack but my Japanese knives are sharpened to angles of 12-15 degrees. Other than approximating with a matchbook does anyone else have a suggestion on how to keep the angle consistent when sharpening on a stone? Repeat four more times using the same amount of pressure, then repeat on the other side of the knife. This will push the carbon atoms into alignment, which results in sharpness. Return to the first side of the knife, then do three passes instead of four on both sides, then two, then one. Bam, freshly sharpened knife. Awesome knife sharpening "hack" I will try it with my old wustof workhorse chefs knife. It's thick and can stand a lot of abuse. If it works it will make good practice for sharpening my more finicky Japanese knives. Resolution for 2016 is to learn to sharpen my own knives and tools. Thanks! There are different grades and types of knives and different methods of sharpening them. 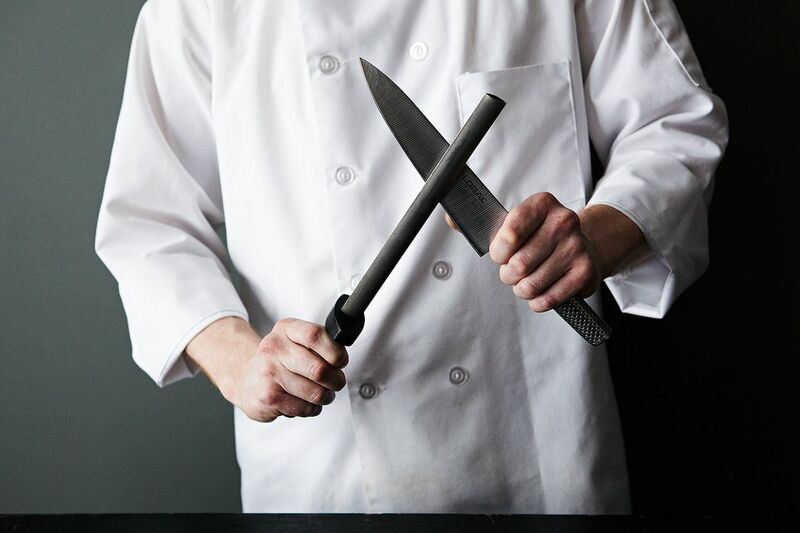 It all boils down to two choices; find the best method of sharpening your own knives, or send them to a professional. This article is meant to be a general guide for the beginning cook, not a magic bullet for every knife in the hand of every chef, cook or house wife. Serrated knives can be honed along the entire curve of each serration with the spring-action honing surface of this sharpener: http://brodandtaylor.com/knife-sharpener/ . It also works on regular knives. What’s the best way to sharpen an Asian knife? Because Asian knives have a 15-degree cutting angle on the blade—unlike European knives, which use a wider 20-degree angle—you can’t put them on just any sharpener and expect to get back that perfect, effortless slicing you enjoyed when the knife was new. If you live in NYC you can take your knives to Samurai Sharpening at the Chelsea Market on Wednesdays and Saturdays and get them done while you shop. Marge has been sharpening my knives for years and years and does a great job. Finger snaps for Marge. Also, if you live in NYC, beware the sharpening trucks. Nostalgia aside, they are electric sharpeners on wheels, with all the caveats that entails. -Do get a good stone or two and learn how to use them (Google it). You have to choose between water stones or oil stones. It doesn't matter which. You can also use diamond stones if you're a non-traditionalist. -If this procedure seems like it isn't worth it, your knives are probably not very good, and you're probably content to be useless as a cook, so what are you worried about? Buy yourself a Ginsu, crack a Bud Light and boil up some instant ramen. Oh dear God! Is that man putting a Global in an electric knife sharpener? The horror. I find it easy, cheap, and effective, though I still have to take my knives into a pro from time to time. These are fine for inexpensive knives. You ultimately have less control over what happens to the blade - which may be a good thing, as you get some deniability. But the process is essentially the same as using a whetstone. What about using a ceramic mug? Those are great for coffee and if you don't have a steel but they're not intended to actually sharpen your knives. I didn't realize you can get sharpening stones at hardware stores. Thank you for the suggestion! There are devices for sharpening serrated knives, but they seem really Brookstone-y to me. Unless you really love your knife, I'd upgrade when you can no longer cut with it. You can get a nice sharpening stone at www.cutleryandmore.com which is where I bought mine.